Tuscany is world famous for its food, its rich culture and its stunning landscapes. Get lost in Florence’s tangle of ancient streets taking in the facades of its art-studded churches and museums. Take a walk around Lucca’s city centre which is almost completely closed off to traffic and surrounded by medieval walls – the ideal place to stroll around and window shop. Discover San Gimignano, a small hilltop city full of ancient towers, and a lovely place to while away the afternoon. There’s lots to discover on our Italian Cooking Holidays in Tuscany. April, May, October in Tuscany are quite mild, not hot or cold. There are less tourists around and the cities are quieter. June and September are lovely and warm without being too hot. This is the ideal time to travel weather-wise but also the busiest time to be in Tuscany. July and August are the hottest & sunniest months. If you like the heat, this is the time to go. Our Flavours transfer will meet you at Pisa Airport. We will then take you to the villa for welcome drinks on the terrace followed by dinner prepared by our local chef. After breakfast you have your first cooking lesson with the chef, enjoying the results for lunch. The afternoon is free to enjoy as you wish. Dinner is prepared at the villa. Visit local winery and enjoy private wine tasting. Enjoy your second hands-on cooking lesson, lunch and then visit a local winery for a private wine tasting. Return to the villa for dinner prepared by your chef. Day 4 (Tuesday): Visit stunning Siena on your sight-seeing trip. After breakfast, a day to enjoy sight-seeing or shopping in Siena at leisure. Lunch will be at a trattoria. Return to villa late afternoon for dinner. 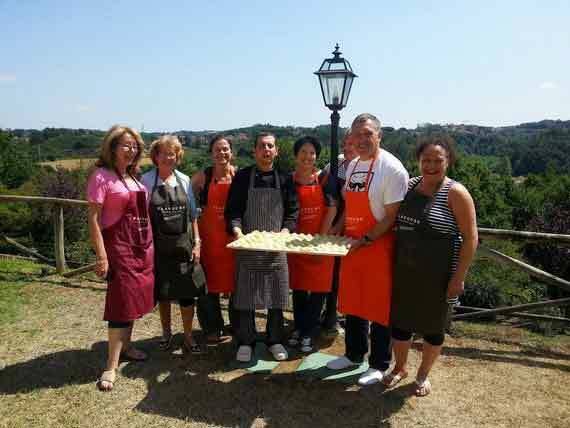 Day 5 (Wednesday): Begin the day with a cooking lesson and relax in the breathtaking Tuscan countryside in the afternoon. Another cookery lesson this morning and then lunch. The afternoon is yours to relax by the pool or walk through the olive groves. Dinner tonight is at the villa. Day 6 (Thursday): Fourth cooking lesson and afternoon visit to Arezzo. This morning is your fourth cookery lesson, followed by lunch. Afternoon visit to Arezzo with a chance to explore before dinner at a local restaurant. Day 7 (Friday): Final cooking lesson with farewell dinner in great company. After breakfast you have your final cooking lesson and lunch. Enjoy your afternoon relaxing at the villa and in the evening a farewell dinner. Day 8 (Saturday): Morning transfer to Pisa Airport. After breakfast our transfer will collect you and take you back to Pisa Airport for your fight home. 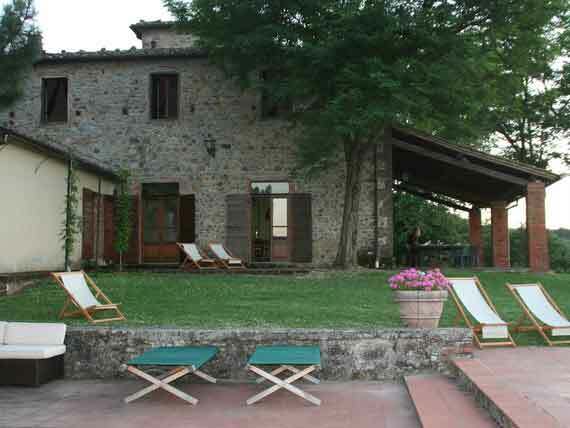 The villa is one of four lovely Tuscan venues located between the Arezzo and Siena provinces. A beautifully restored, luxury farmhouse that is set amongst fifty hectares of olive groves, vineyards and woodlands. Excellent craftsmanship went into the renovation, taking care to maintain its unique old-world charm. The pool area, furnished with a gazebo, overlooking the rolling Chianti hills, makes this villa an ideal place to come and relax in the Tuscan countryside. 5 cookery lessons with our Italian chef. Private, en-suite accommodation in our Tuscan Villa. Visits to local towns, eg Arezzo & Siena.